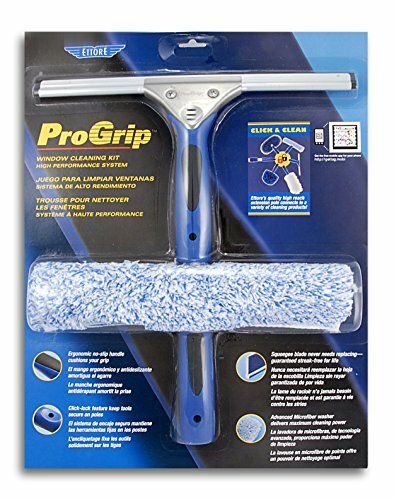 Unger Professional Microfiber Window Combi: 2-in-1 Squeegee and Window Scrubber, 10"
The commercial floor squeegee is perfect for garage, tile, wet floor, suitable for variety ground. 180 Adjustable Knuckle Joint: Easy to clean the neglected corners, window surfaces without scratching. 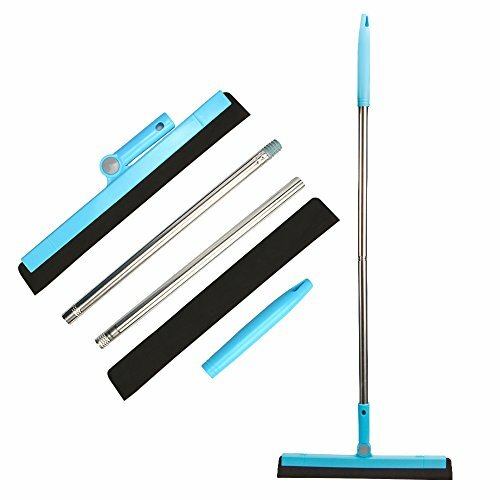 Multifunctional water squeegee: perfect for garage, tile, wet floor; The floor squeegee can easily removes hair, water, dirt, etc, can be used as window squeegee as well. Materials: high quality foam blade, stainless steel handle. Clean windows faster with this 2-in-1 professional squeegee and scrubber window cleaning tool from Unger. This 10-inch squeegee and scrubber attaches to any Unger pole (sold separately) for extended reach. The sleeve is machine washable. 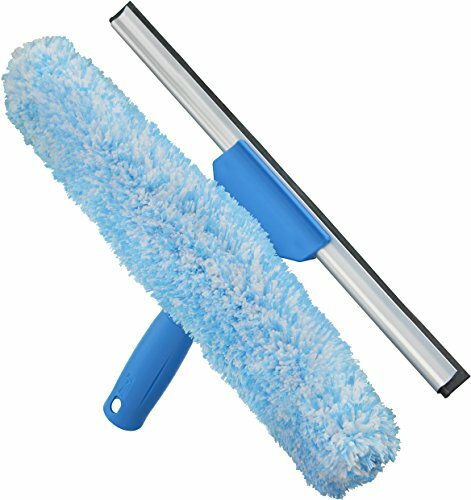 This combination squeegee/scrubber is ideal for both commercial or residential use. Unger guarantees to replace any Unger Professional branded product found defective in material, construction, or workmanship. Clean windows faster with this 2-in-1 professional squeegee and scrubber window cleaning tool from Unger. 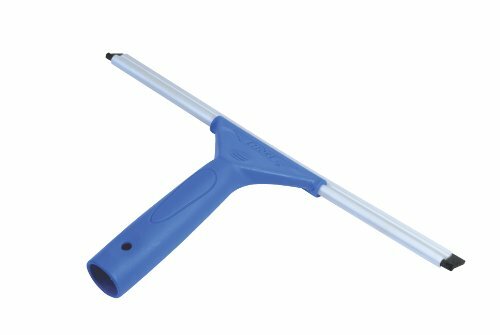 This 18-inch squeegee and scrubber attaches to any Unger pole for extended reach. The sleeve is machine washable. 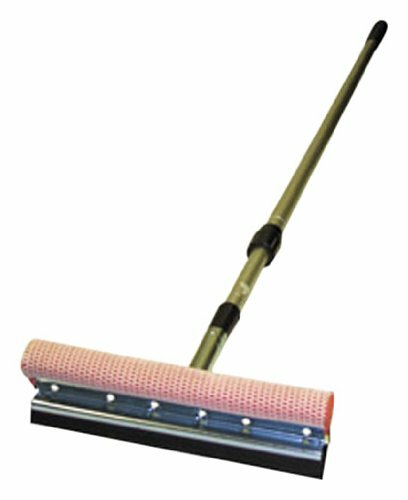 This combination squeegee/scrubber is ideal for both commercial or residential use. Unger guarantees to replace any Unger Professional branded product found defective in material, construction, or workmanship. 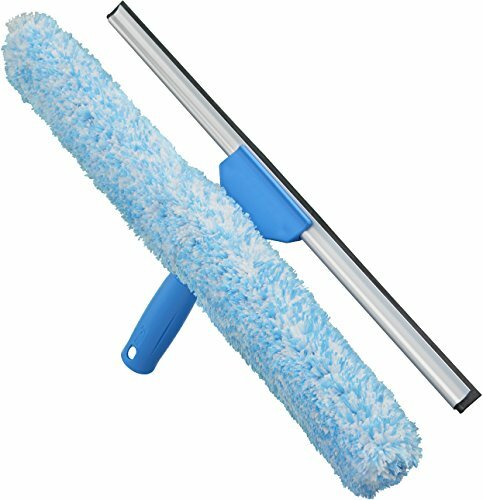 24" heavy duty curved floor squeegee. One handle for life - replace only the squeegee blades when worn. Advanced elastomer handle connector never breaks. All-weather sleeve protects your hands. Flip it over and use non-abrasive scraper. 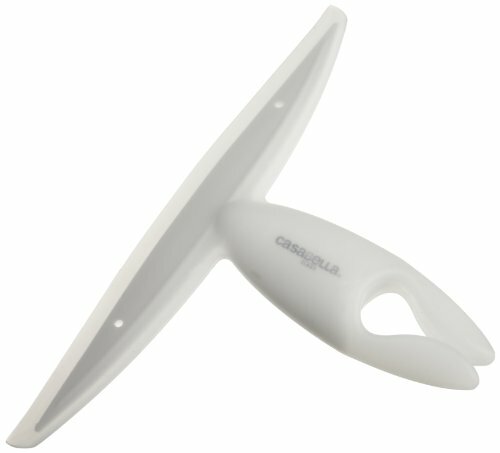 Double neoprene blades for excellent wiping and even when working on rough surfaces. MADE IN USA (With USA & Global Components) Because We Live Here! MR.SIGA 14-inch (35cm) Window Cleaning Combo includes 2 tools. The 35cm squeegee, great for any smooth surfaces, aluminum clip with replaceable natural rubber blade that removes water effectively and leaves your window clean and streak-free. It's light weight plastic handle can connect with MR.SIGA telescopic pole for height or ceiling. 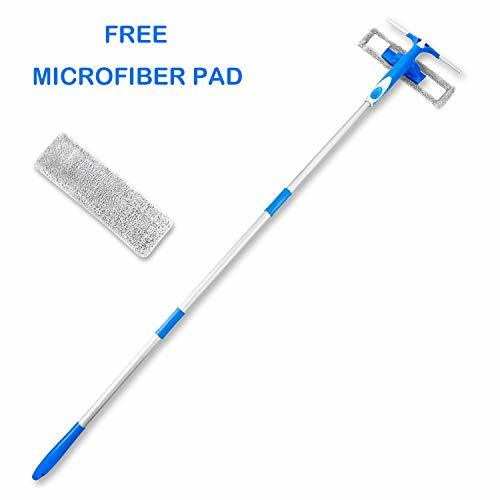 The 35cm microfiber window washer, thicker microfiber Cloth has a better water absorbing effect, and uses Hook & Loop system to fasten, convenient to replace and machine washable. It can also work together with our MR.SIGA telescopic pole to reach height or ceiling. This 35cm Window Cleaning Combo is a must-have tools for windows cleaning. Enjoy Cleaning, MR. SIGA providing high quality cleaning products for everyone, to make cleaning becomes effortless & more comfortable, our Mission is to " Let the Housework easier, Make the World Cleaner". 22-inch length by 3 1/4-inch width by 5 1/2-inch height. Made in the USA. Als Ellan 3 in 1 Double Face Window Squeegee is a professional cleaning tool, it is ideal for every cleaning. It make your work easier. Everybody don't like messy windows, it will let you down. Now you don't have to worry about falling off a stool, the extension pole will help you reach the high windows easily. Scrub, Wipe and Clean, just need a simple wipe, leave a streak-free clean, clear surface. Just a few minutes you can clean your floors and move on to the more important things in your life. Keep one in the shower or the bath to keep mirrors, glass walls, and doors spot free and dry; in the car to remove dew or condensation from windows.Use each tool as it comes, or separate the microfiber from the rubber blade to use each part by itself. Get a bright window right now, Enjoy the Beauty! Don't waste your money on poor quality products. Our products use environmentally friendly materials, you can use it comfortably for lots of years, never bad experience. The greatest design of this product is with a removable spray head, which you can use to clean your car window without buckets. Hand fatigue after extended cleaning sessions can be a major problem. Your hands will thank you for using these commercial-grade spray heads. 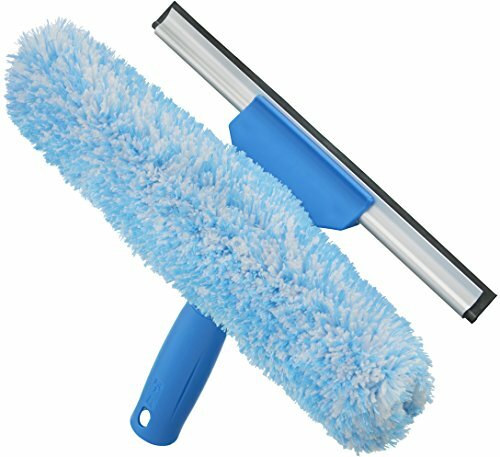 1 Squeegee with Removable Spray Head 1 Microfiber Scrubber 3 Extension Poles (total length:59 inch) Friendly Service: When you order from us today you are protected by a no-questions-asked thirty day money-back-guarantee and world class customer service. Simply contact our customer service department and we will take care of you! All IN ONE: Made of ABS quality plastic materials for 100% safe, comfortable and sturdy. Silicone blade with precision edge can protect your windows, used in variety of environments, streak-free drying. Professional Microfiber cloth can attract all the window dust without chemicals, clean your windows quick and easy. The squeegee is ideal for cleaning windows, glass, showers, autos, and mirrors, just need a simple wipe. SAVE TIME: Simplify window cleaning, cut the time. 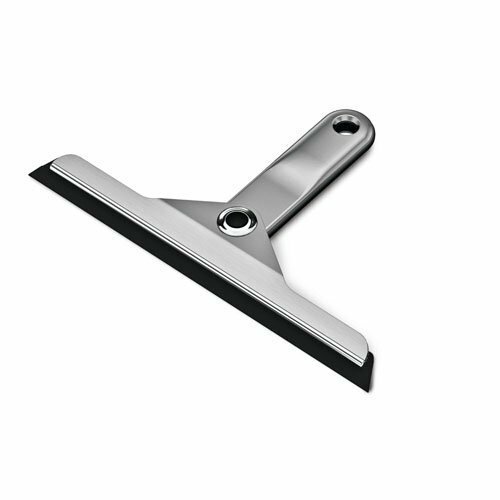 The wide squeegee design covers a large surface area quickly. 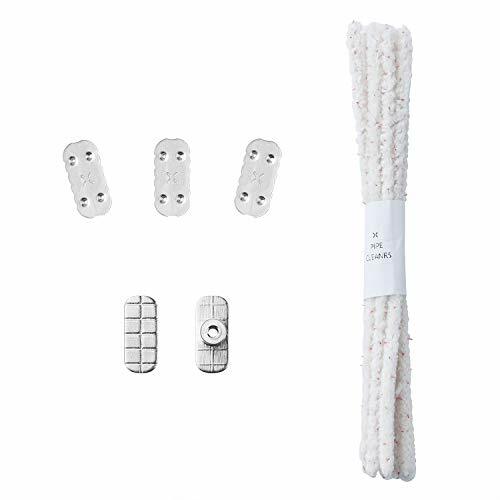 Use the microfiber scrubber and squeegee blade connected together as one tool, or separate the squeegee and microfiber scrubber and use them separately. When combined you can clean and dry with a single motion or use one tool at a time for specific jobs. MULTI FUNCTION: 1. The Squeegee with a removable spray, clean the window while spraying water, cleaning without buckets. IMPROVE YOUR EFFICIENCY! 2. 180 Degrees head automatically adapt to any angle, help you finish different jobs. EASY TO CLEAN AND STORE: Professional Microfiber pad can be washed over and over, need no more pads. The extension pole can be divided into 3 sections (total length:59 inch), just need little space to store,or hang it. The simplehuman foldaway squeegee has an anodized aluminum handle that folds up for easy storage. The precisely angled blade and weighted handle are designed to promote a smooth glide across surfaces for an easy, streak-free clean. Comes with a suction cup so you can easily hang and store. Socket for cast aluminum. Rubber for SBR for synthetic rubber 7/32" x 2". Cleanup for mineral spirits or petroleum based solvents. Primary uses for general maintenance, economical. 16 Gauge curved plated steel. Excellent for abrasion resistance. Good for acid, alkali, ozone and sunlight resistance, animal and vegetable oils, degreasers, high and low temperatures. Fair for scuff resistance, Benzyl and Toluol (solvents), gasoline and oil (petroleum products). 36" Curved length. 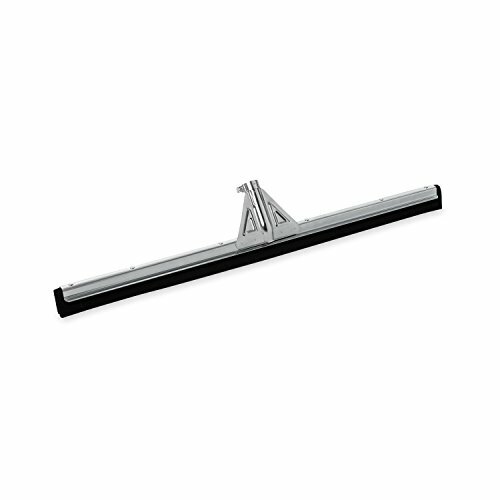 Ettore s 24-inch Curved Industrial Duty Steel Floor Squeegee is excellent for moving water and clean-up on grounds and floors. Perfect for decks, garages, driveways, sidewalks, industrial sites and beyond. Size: 196.9 inch L x 1.6 inch ( W). SIZE & FUNCTION 196.9 inch L x 1.6 inch ( W) felt strip with white color, easily matching any flooring and decor Dust proof, shock-absorbing, sound and heat insulation, anti-skidding and insulating, widely used in various door seal, window insulation, furniture, electrical cabinets, cars, speakers, toys, sports equipment and more. 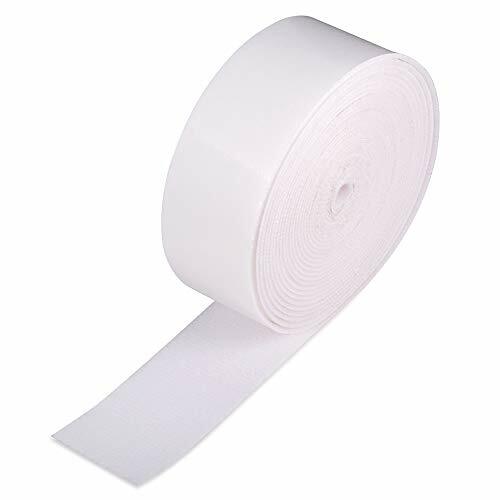 STRONG ADHESIVE backing and non-degumming, stick firmly, lasting durability, great weather stripping for doors and windows. 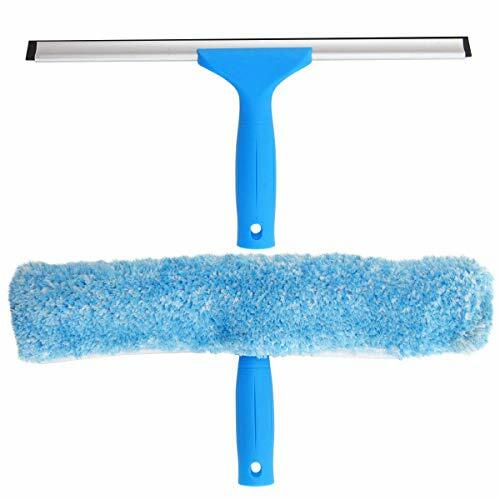 GOOD REPLACEMENT OF VINYL WRAPING SQUEEGEE Th squeegee felt can suit for squeegee with any sizes, you can cut it up according the size you wanted. For 30 years Carrand has pioneered automotive cleaning with innovation, quality, and value to help customers maintain their vehicles' "showroom new" appearance inside and out. 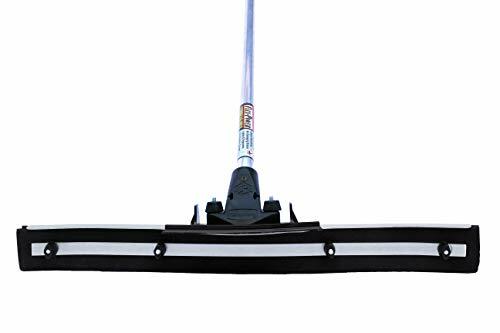 Carrand s 10-inch metal squeegee head with 48-inch to 84-inch extendable handle is rust resistant, has EPDM pliable blade, bug scrub netting and plastic side guards protect glass. Brand New. High Quality. Precision cut Aftermarket Pax 2 & 3 screens. Compatible with all Pax a2 & 3. Please clean the chamber for perfect fit. Replacing your screens helps keep devices Fresh & Clean and increase the flow and flavor of your devices. Satisfaction Guarantee: If the item make you dissatisfied or have any quality problems, just contact us by email, we would replace any defective products for our customers.